In 1997, Davis-Martin-Powell was selected to perform a wastewater Planning Study for the City of Winston-Salem. The goal of this study was to analyze existing sewer infrastructure in the Deep River and Abbotts Creek sub-basins and develop a 25-year plan to provide for future growth. This Study evolved into a 201 Facilities Plan Amendment and Environmental Assessment. The Town of Kernersville was then able to obtain $7.5 million in low-interest loan funds for their portion of the $10.4 million project cost. 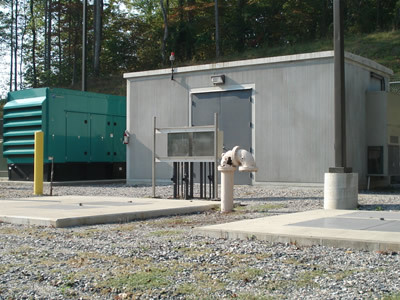 In 2002, the City of Winston-Salem selected DMP to prepare construction documents to relocate the existing Deep River Pump Station. The location of the relocated pump station was chosen to provide service to an area bordered by Interstate 40, Highway 66 and the Guilford County Line, based on the sewer Master Plan developed by DMP. The new Deep River Pump Station is a duplex submersible design, with a firm capacity of 1,250 gpm (1.8 MGD). The station was designed with variable frequency drives (VFD’s) and ultrasonic level sensor to provide the City with the capability of handling existing flow conditions and higher future flow conditions. 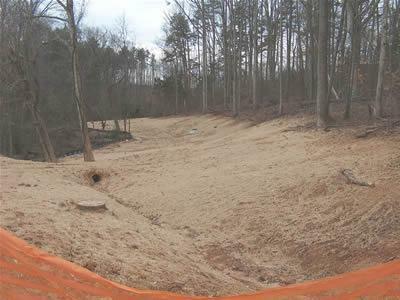 Site topography and proximity to an existing stream (falling within the Randleman Buffer Rules) dictated creativity in design, including extensive erosion controls, an access drive with a large box culvert, and a segmental retaining wall. The line work included 7,600 LF of 12” forcemain, 4,000 LF of 8” gravity sewer, and approximately 13,600 LF of 12”-18” gravity outfall. This $2,800,000 project was bid and constructed as part of a State Revolving Loan Fund project between the State, the Town of Kernersville and the City of Winston-Salem. 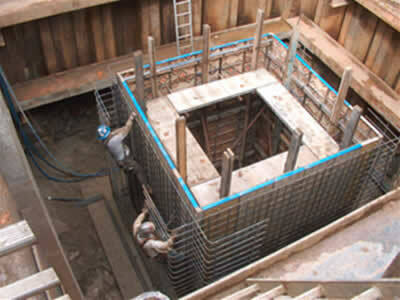 The new Deep River Pump Station, forcemain, and accompanying three (3) outfalls were completed and placed into service in Summer 2005.